The Intellis platform was designed to overcome limitations with current SCS systems, such as battery performance, and can power the EvolveSM workflow, which standardizes guidance and balances high-dose (HD) and low-dose (LD) therapy settings. Advanced Activity Tracking: The Intellis neurostimulator uses Snapshot™ reporting to record and track patient activity 24/7, enabling physicians to address the subjective and personal nature of chronic pain by monitoring progress and making modifications to better suit their patients’ therapy needs. This can help optimize treatment and improve patient-physician communication by tracking and sharing daily activities, body positions and therapy usage and by giving physicians an objective look at mobility and progress. Reduced Recharge Burden: The Intellis platform addresses a common patient complaint: the daily or weekly recharge burden. With Medtronic’s proprietary Overdrive™ battery technology, the Intellis battery can be fully recharged from empty to full in approximately one hour and physicians can now estimate recharge intervals based on therapy settings. Simplified Programming and Upgrades: The Intellis platform uses secure wireless clinician programmers managed on the Samsung Galaxy Tab S2 tablet interface that enable faster delivery of evolving workflows and software upgrades. The Evolve workflow is standardized guidance to simplify the trial and implant experience and optimize patient options. Broadest MRI Access: The Intellis platform includes Medtronic’s proprietary SureScanTM MRI technology for the broadest access available to MRI diagnostic imaging and simplest eligibility determination, which allows MRI scans anywhere on the body under certain conditions. Personalized Pain Relief: The Intellis platform includes AdaptiveStimTM technology for automatic adjustments to deliver the right therapy dose to the right location, as the pain target shifts based on body position. Medtronic has the broadest portfolio of pain therapies, which have been in use for over 40 years and have benefited hundreds of thousands of patients worldwide. Medtronic developed and leads the field of neuromodulation, the targeted and regulated delivery of electrical pulses and pharmaceuticals to specific sites in the nervous system, and continues to innovate and bring patient-centric advances. 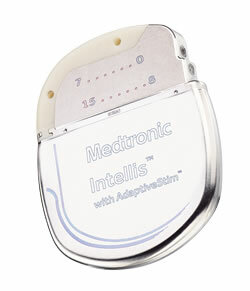 For additional information on Intellis, please visit http://www.intellispainstim.com. Mekhail N, Wentzel DL, Freeman R, Quadri H. Counting the costs: case management implications of spinal cord stimulation treatment for failed back surgery syndrome. Prof Case Manag. 2011;16(1):27-36. Kumar K, Taylor RS, Jacques L, Eldabe S, Meglio M, Molet J, et al. The effects of spinal cord stimulation in neuropathic pain are sustained: a 24-month follow-up of the prospective randomized controlled multicenter trial of the effectiveness of spinal cord stimulation. Neurosurgery. 2008;63(4):762-70.